EIF senior research officer Inês Pote introduces our new outcomes framework specific to addressing parental conflict. What do you think, and how could we develop it further? A key part of our work programme at EIF is to support local areas to reduce the incidence and impact of conflict between parents, and in so doing, to improve long-term outcomes for their children. One of the key issues which we keep returning to is how to improve the measurement of parental conflict and its impact on children. To help with this, we have developed the first iteration of an outcomes framework specific to addressing parental conflict – and now we would like your feedback to develop it further. Our work on reducing parental conflict has evolved significantly over just a few years. Back in 2016 we published a seminal evidence review, led by Professor Gordon Harold from the University of Sussex, on what works to enhance interparental relationships and improve outcomes for children. This review presented robust evidence that the quality of the relationship between parents, whether they are living together or apart, has a significant influence on effective parenting and the relationships between parents and children, as well as children’s long-term mental health and future life chances. Since then we have been working hard to enable local areas to tackle this issue, by supporting the roll-out of the national Reducing Parental Conflict (RPC) programme, by publishing a practical (and regularly updated) commissioner guide, and by developing the online Reducing Parental Conflict Hub, launched in February 2018, which hosts a range of resources to help local leaders, commissioners, practitioners and researchers with an interest in reducing parental conflict. While there is a strong case for making parental conflict a priority, in terms of reducing a key risk to children’s long-term mental health and wellbeing, practical challenges remain – as they do in so many areas of early intervention. In particular, the quality of data on parental conflict at both national and local levels is often poor and out of date. Quality measurement relies on having a clear picture of which outcomes matter, and how these outcomes interrelate – which child outcomes might indicate an issue somewhere else in the family system, or which aspects of parental relationship quality have the most significant effects on child outcomes. This need is well understood: we regularly receive requests for an outcomes framework that is specific to reducing parental conflict at a local level, and we cover the role of outcomes frameworks in local systems within the RPC Planning Tool. But to this point we haven’t been able to provide an example framework or advice on how to go about developing one. Now, as a first step, we have developed the first iteration of an outcomes framework which is specific to addressing parental conflict. 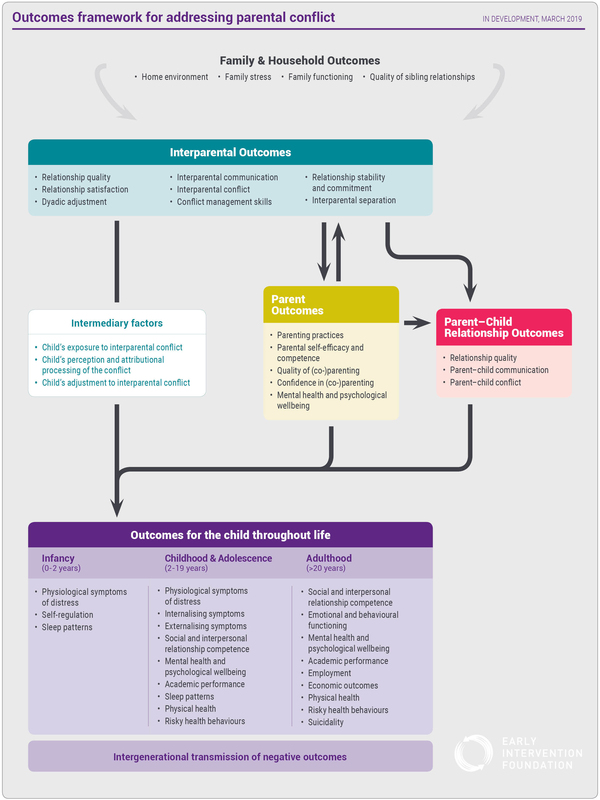 The framework maps out the child, parent and family outcomes that can be supported by programmes and services that target the quality of the interparental relationship. We believe that a well-designed outcomes framework can provide local areas with a helpful conceptual basis for understanding the relationship between different outcomes, including the links between interparental conflict and outcomes for parents, children and the wider family. It also provides a helpful structure for a local needs assessment, and clarity on what outcomes to target, measure and monitor over time, to help inform strategic plans and local system development. The first iteration of the framework shown below is very much a work in progress. It has been developed by the EIF team, based on a review of both our 2016 what works report and our follow-up review of the evidence on interparental conflict and outcomes for children in the contexts of poverty and economic pressure. We also considered our ongoing work on measurement tools (stay tuned for more on this!) as well as a selection of academic sources, including the very helpful review by Masarik and Conger on the family stress model. Through this exercise, we are aiming to develop a framework that is rooted in evidence and which clearly shows the outcomes that can be influenced by targeting the interparental relationship. Because we draw on reports that are based on high-quality longitudinal studies, we can also show with some confidence the direction of associations between different outcomes. However, we know that there is still work to do to ensure the framework is as useful as possible to you. What do you think about what we have created so far? Does the framework make sense to you? How might you use it? Is there anything we have missed out? Is there a particular aspect of it that we should focus on developing? Do you have an example framework that we could learn from? We really want to make this framework work for you; therefore, if you have any feedback or questions, please do get in touch. We would really value having a few critical friends to bounce ideas off. Over the next year, we intend to test and refine the framework further by collaborating with service providers, commissioners and other stakeholders through interviews, focus groups and workshops. We’d also like to populate the framework with suitable (practical, reliable and valid) measures for assessing the selected outcomes, so that together we can work to improve the availability and quality of data on the impact of parental conflict on children and the whole family.